And when these football professionals talk, it sure sounds convincing. They can predict the future, give their reasons, and make it plausible. And it’s fascinating. They may end up being wrong (and who among them wasn’t wrong about the Patriots versus the Giants? ), but that goes with the territory. Once the Super Bowl has come and gone, I usually suddenly become a lot more productive, because I’m no longer devoting hours of my life on Sundays (and Mondays, and possibly other days) to watching football. No more ESPN coverage of NFL games? No more in-depth analysis of players and matchups and momentum? What will I do with myself? Not to worry, because right after the Super Bowl this year, we had Super Tuesday in the presidential primaries. Perfect timing! Now I can take all the time I was devoting to watching NFL analysis on ESPN and roll it directly over to watch presidential primary coverage and analysis on CNN. And on CNN, which constantly touts “the best political team on television,” we’ve got knowledgeable in-depth analysis of both party primaries that might as well be in-depth analysis of the NFC and AFC. We’ve got teams (candidates) in each league (Democrats and Republicans) vying for the playoff spots (the smaller field of candidates) so they can eventually reach the Super Bowl (nomination to the general election). And the coverage on CNN is something awesome to behold, if for no other reason than for its bright, high-gloss polish and advanced technology. Have you seen the CNN Politics TV set? It makes Wolf Blitzer’s Situation Room look like an exercise in restraint. The CNN Politics set has managed even to make SportsCenter look low-tech. I’ve always marveled at the extreme stylistics of the “sports desk” on cable sports channels: Who came up with something that looks so high-tech and cool just so two or three or four guys can sit behind it and go on about how great Tom Brady is? CNN has a fancy desk too, and a whole room of gadgets for its Best Political Team on Television. And then there’s that Delegate Map. Have you seen this thing? CNN’s John King, who we might as well just call the Delegate Map Guy, has at his disposal one of the coolest (and at the same time needlessly excessive) gadgets ever designed for political punditry. He’s got a 50-inch widescreen monitor with a big map of the United States with touch-sensor capability that he uses to show who has the delegates and where, and every hypothetical scenario you would ever need for Obama’s and Clinton’s tight race for the Democratic nomination. 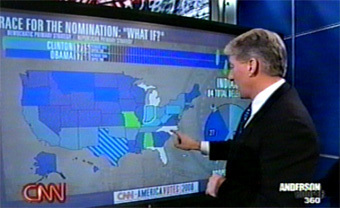 He touches the screen here and here and here and turns states dark-blue to indicate Obama’s possible wins, and then touches it there and there and there to turn states light-blue to indicate Clinton’s. As he does this, the bar graph at the top adds delegates to the candidates’ tallies. At the end of the bar graph is the “finish line” indicating the nomination. And to zoom in or out to show a specific region of the country, King puts his fingers on the screen and spreads them out or narrows them together, as if he’s in an iPhone commercial. But that’s not all. On election night, King can zoom in to individual counties and make isolated vote and delegate counts, all while live results are filtering into the database and updating the map and tallying votes instantly on the fly. King touches a county and it shows how many votes each candidate has at that moment in that county with 34 percent of precincts reporting. And I’m thinking, who developed this software and this interface and how much did it cost? It’s cool, but it’s crazy. We clearly have too much time on our hands to be entertaining ourselves with all this tallying and punditry. I guess if candidates can spend untold millions on presidential campaigns, it makes sense for CNN to spend hundreds of thousands on customized election-coverage gadgetry. After all, sports is an enormous consumer industry. In our election in Australia last year, one of the networks ran a graphic of a shredder that they used every time and MP lost their seat. Every time they recapped, the animation showed a photograph of the politician going into the shredder. It was hilarious, especially since the Prime Minster’s seat was called for his opponent and he kept getting shredded over and over again. The hilarious indignity of it all. All said without letting slip your preferred candidate. Now thats an exercise in restraint! Why do you feel wrong for thinking they’re kinda nifty? They ARE nifty. I find it impressive myself. My point that it’s all a bit excessive should in no way take away from the general niftyhood.